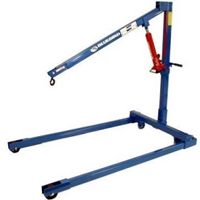 Ideal for removing and installing engines and other assorted lifting jobs. Boom hook rotates 360 degrees for ease picking up, loading and repositioning objects. Precision jack is engineered to exacting specifications, with slow release valves and chrome plated rams. Knock down hoist. It should fit easily into almost any vehicle. Rated for #1000 capacity.